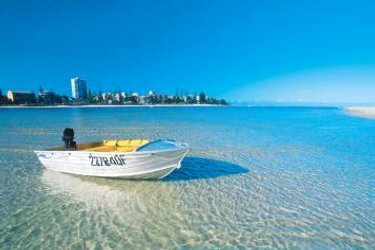 Ozhotels is a group of independently owned and non-related hotels, resorts and serviced apartments situated in the holiday destination of Caloundra on the Queensland Sunshine Coast. Ozhotels allows you to deal directly with the apartments and resorts, therefore giving you the best possible rates for this Caloundra accommodation. 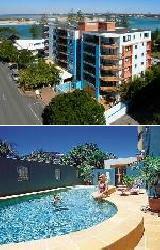 So book your next resort or apartment holiday accommodation in Caloundra online and get great discount rates. Ideally positioned on the southern edge of the beautiful Queensland Sunshine Coast the tourist destination of Caloundra is popular with all different types of travellers and includes a large variety of places to stay, ranging from fully self contained holiday apartments and luxury resorts right through to budget hotels and motels. This range of accommodation in Caloundra is what makes finding the perfect place for your holiday needs a difficult and time consuming task, which is why many people like to use the free services of an accommodation expert like OzHotels. Using this service allows you to compare hundreds of different properties that are situated all over Caloundra, in order to find the one that meets their specific requirements and travel budget. The main advantages of booking online with OzHotels is that you can book your travel up to 12 months in advance and that you will be able to get an extra discount off the already cheap rates the longer that you holiday in Caloundra. 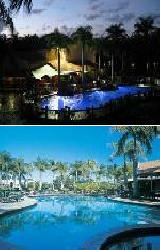 The Shearwater Resort is located in the heart of Kings Beach on the Queensland Sunshine Coast. Shearwater Resort provides luxury Caloundra accommodation with stylishly appointed resort apartments catering for both the leisure and business traveller. This 4.5 star property features great recreational facilities including a heated swimming pool, spa, children's wading pool, gymnasium and a games room. The Shearwater Resort Apartments is located just a 50 metre stroll to the patrolled surf beach and also features six retail shops and restaurants on the ground level. This budget Caloundra accommodation comes complete with private balconies which have stunning views over the Caloundra waterways and are spaciously appointed with modern facilities. The Shearwater Resort has its own conference centre, The Vue Room catering for up to 150 delegates and is the perfect venue for weddings and boutique events. 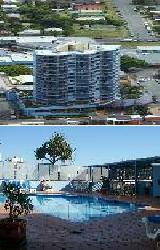 For more Caloundra Apartments click here. With a wide range of hotel rooms, studio apartments, 1 & 2 bedroom self contained serviced apartments and 2 bedroom villas the Oaks Oasis provides discount holiday resort accommodation in a central Caloundra location right on the southern tip of Queensland's beautiful Sunshine Coast. This affordable property is ideally situated only metres from the clear ocean waters of Golden Beach. The Oaks Oasis Caloundra Serviced Apartments Resort is set amongst 10 acres of landscaped palm gardens and provides all types of travellers with discount accommodation in Caloundra. 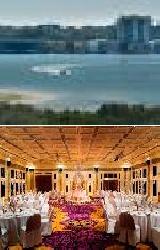 It also features a wide range of modern amenities and services such as lounge bar, conference centre, disabled facilities, free car parking, guest laundry, lift, restaurant, spa, outdoor swimming pool, tennis court, tour desk, baby cots for families, dry cleaning service, facilities for disabled guests and secretarial services at reception. The Cheltenham Apartments provide couples and families on holidays with a selection of 2 bedroom self contained serviced apartments that are ideally positioned only 2 minutes stroll to the magnificent patrolled Kings Beach. 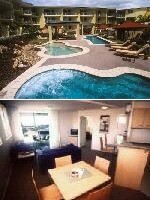 The Cheltenham Apartments in Caloundra is close to everything that the region has to offer, as well as having a numerous guests facilities and services including direct internet access, free car parking, guest laundry, outdoor swimming pool, tour desk, bbq facilities and a landscaped garden. The back gate of the Cheltenham Apartments Caloundra Resort takes you across the new Kings Beach parkland area with stage where there are various live concerts from time to time and a great playground area for kids yet only 2 minutes walk to the patrolled Kings Beach. 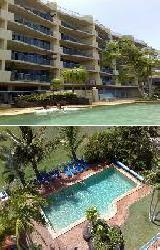 The Belvedere Apartments is well situated in the heart of Caloundra on the beautiful Queensland Sunshine Coast. 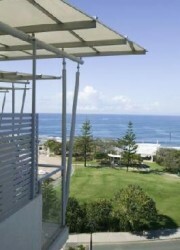 This very affordable property provides all types of travellers with discount accommodation in Caloundra. It also features a wide range of modern amenities and services such as free car parking, guest laundry, lift, outdoor swimming pool, tour desk, bbq facilities, airport shuttle and baby cots available for hire. The Belvedere Apartments are within easy driving distance is Ettamogah Pub, Australia Zoo, Glass House Mountains National Parkland, Greg Norman's design Pelican Waters Golf Course and the Ginger Factory. The Sunshine Coast offers a relaxed lifestyle and where better to explore this but from the comfort of The Belvedere Apartments with superior customer service in luxurious quality accommodation and a convenient location. Sails Resort on Golden Beach provides luxelf-contained and spacious apartments that are ideal for an enjoyable and relaxing holiday complete with panoramic water views from the balcony, lounge room and kitchen on the apartment. This absolute waterfront holiday accommodation in Caloundra on the Queensland Sunshine Coast has direct beach access and city views of the nearby Caloundra CBD and the Pumicestone Passage to Bribie Island. 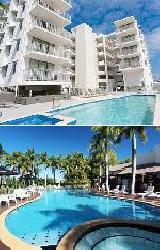 Sails Resort on Golden Beach, Caloundra offers a choice of 2 and 3 bedroom holiday apartments and penthouses, all of which are spacious, modern and non smoking. The guest facilities at the Sails Resort in Caloundra includes security intercom, individual lockup garage, heated swimming pool, jacuzzi, gas barbecue, sheletered outdoor entertaining area, landscaped gardens, airport shuttle, lift, tour desk, Wifi access and bicycle hire. Rydges Oasis Resort in Caloundra is perfect for honeymooners, couples and family holidays with the choice of hotel, spa, studio, 1, 2, & 3 bedroom villa and self contained apartment accomodation. The property is ideally set amidst ten acres of landscaped palm gardens and waterlily lagoons in beautiful and sunny Caloundra, just 150 metres from Golden Beach and close to the cosmopolitan cafes, shops and restaurants of Bullcock beach. The Rydges Oasis Resort Caloundra in Caloundra is close to everything that this holiday location has to offer, as well as having a numerous guests facilities and services including lounge bar, faxing facilities, free car parking, guest laundry, restaurant, spa, outdoor swimming pool, tennis court, garden, 24 hour reception and baby cots for hire. The area is also home to many attractions, including Australia Zoo, Underwater World, Big Pineapple and the Pelican Golf Club. 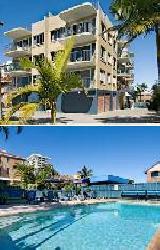 AT the Belaire Place Apartments holiday makers can experience the best of the Sunshine Coast. Located in the heart of Caloundra overlooking Pumicestone Passage and the magnificent Mountains the Belaire Place offers fully self-contained 1 bedroom apartments. The friendly atmosphere and excellent facilities of this ever-popular beachside Caloundra accommodation allow you to sit back and soak up the relaxed Queensland lifestyle. The Belaire Place Apartments are situated less than 50m from the beach and 100m from the city centre, allowing you to stroll to the water, shops, park, bus station, TAFE, Community Centre and many restaurants. This exceptional Caloundra accommodation features a sparkling saltwater swimming pool, gymnasium, spa, Free secure underground car parking, luggage storage, guest laundry and tour desk. Leave your cares at home and relax in the friendly, quiet atmosphere of Belaire Place Apartments Caloundra. 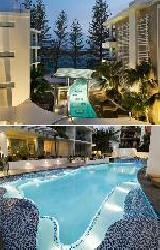 The Centrepoint Apartments Caloundra provides families, couples and individuals with the holiday of their dreams. With magnificent sandy beaches spread out before you and views that stretch forever over the Pumicestone Passage to Bribie Island and beyond the Centrepoint Apartments truly is a remarkable place to spend a relaxing holiday on the Queensland Sunshine Coast. Centrepoint Holiday Apartments offers self contained serviced 1, 2 & 3 bedroom apartments that are ideally located in the heart of Caloundra with cafes, shops, restaurants, boutique shopping, safe swimming beaches and a range of water sports just a stroll away. All of these Caloundra apartments are modern, spacious and non smoking, featuring a private balcony with spectacular views and all of the facilities to maek you feel right at home. Located on the beautiful Sunshine Coast in Queensland, Rumba Beach Resort Apartments is all about good times, with luxury Caloundra apartments, fantastic resort style facilities, exquisite surroundings, direct beach access and the friendliest service possible. This holiday accommodation in Caloundra offers an experience like no other with luxury boutique 1, 2 & 3 bedroom self contained oceanfront apartments providing the perfect holiday escape. The Rumba Beach Apartments Resort brings to Caloundra a standard of luxury accommodation and resort facilities that outshine all others with views sweeping across Caloundra's Bulcock Beach, the Pumicestone Passage national park and mysterious Glasshouse Mountains. Rising elegantly above the resort beachfront plaza, this is where views across to the Bribie Island Marine Park and sunsets behind the jagged Glasshouse mountains take on a whole new dimension. The superbly appointed 4.5 star Caloundra Central Apartments are serviced daily to make sure that everything is to your liking at your Sunshine Coast holiday accommodation. The Caloundra Central Apartments are ideally situated at the gateway to the many tourist attractions and activities on the Queensland Sunshine Coast including Currimundi and Dicky Beach, Quad Park, Australia Zoo, Underwater World, Corbould Park Racecourse and Aussie World. These luxury self contained Sunshine Coast apartments boast a key card security system to all areas, undercover security car parking, heated spa, outdoor swimming pools and BBQ area. The Caloundra Central Apartment Hotel on the Sunshine Coast now includes the Nikken Health & Wellness key elements in their already luxurious deluxe Caloundra Apartments, which makes your holiday even more comfortable and relaxing.